Many chemicals come into contact with our skin, some intentional and others inadvertently. How much chemicals penetrate our skin? What about that of a baby or those who have defective skin barrier like eczema sufferers? This 5th post of Skin Facts series explores the chemicals our skin comes into contact with. Our Skin Structure – How do Chemicals Penetrate? Chemicals definitely penetrate certain layers of our skin, otherwise, the skincare industry will collapse if all skincare products just stay on the skin surface and no product can claim to improve your skin! Chemicals penetrate different layers of skin barrier (that’s part of the ‘price’ we pay for a skincare product where technology is involved to enhance penetration). Penetration/ Transcellular absorption – via the stratum corneum through the corneocytes (flattened cells that made up the horny layer); Stratum corneum contains about 40% protein (primarily keratin), 15% to 20% lipids and 40% water. Intercellular absorption (main route) – Chemical is transferred around the corneocytes in the lipid-rich extracellular regions; Lipids present in the intercellular spaces of the stratum corneum are by weight: 45–50% ceramides, 25% cholesterol, 15% long-chain free fatty acids and 5% other lipids, the most important being cholesterol sulfate, cholesterol esters, and glucosylceramides. Michaels et al. (1975) is the one who came up with the ‘brick and mortar‘ analogy describing corneocytes filled with lipids. Dermatologists explain eczema skin has the wall without strong mortar holding the bricks. 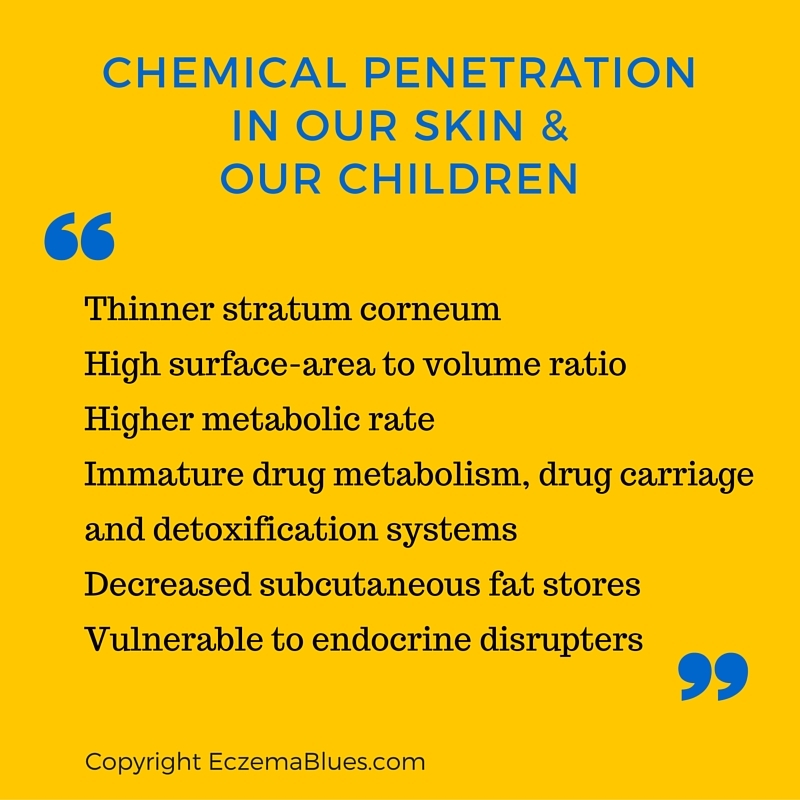 Baby Skin – More Chemical Penetration? It is stated in this article on Scientific American – Scent of Danger: Are There Toxic Ingredients in Perfumes and Colognes? I find it interesting because if you look at your perfume, even the most expensive ones, you would find many of them are irritants and definitely hard to pronounce! There are also ingredients that are ‘hidden’ behind proprietary names given by the brand. Consequence: Irritate, allergenic, allergic rhinitis, chronic sinus, asthma, accumulate in the environment, the body and the breast milk, disrupt the endocrine system (Endocrine system is a network of glands that produce and release hormones). Surfactants are designed to remove dirt and oils from the skin, but the problem is that they can also remove the lipids from the skin as well. This leads to disruption in the skin barrier and exacerbates all the skin barrier problems in atopic dermatitis…Of note, a recent study by Belsito et. al., showed that the surfactant cocamidopropyl betaine (CAPB) is more likely to cause allergic contact dermatitis in people with atopic dermatitis than in those who do not have atopic dermatitis. It is studied that twice daily moisturization with a hypoallergenic (meaning no fragrances, no essential oils, no plant extracts, no formaldehyde-releasing preservatives, no lanolin, no neomycin, no bacitracin, no methylchloroisothiazolinone) moisturizer in high-risk newborn babies lead to an approximately 50% reduction in rates of new onset atopic dermatitis. We have also looked at infants being more susceptible to sunburn. This, on surface, seems to suggest that putting on moisturizing and sunburn is good for the babies but there’s a major caveat that you should not be putting on harmful chemicals since so much more chemicals penetrates infant skin (and possibly even more for infants with defective skin). Use good quality moisturizer, tested safe for babies and without the key irritants AND avoid sun (rather than ‘suntan’ a baby with sunscreen as we’ve seen sunscreen contains quite a fair bit of irritants!). Medscape – How Does Infant Skin Differ from Adult Skin? Pubmed – Absorption of chemicals through compromised skin. Agency of Toxic Substances and Disease Registry – Ethylene Glycol and Propylene Glycol Toxicity- What is Propylene Glycol? Mercola.com – Are You Using This Popular But Cancer-Causing Johnson & Johnson Shampoo? In looking for a product that met all the above criteria for my niece’s daughter who has eczema (no fragrances, no essential oils, no plant extracts, no formaldehyde-releasing preservatives, no lanolin, no neomycin, no bacitracin, no methylchloroisothiazolinone) I came across Emu bliss emu oil. Sent a bottle to her and she said it really helped her daughter’s eczema. Thanks for sharing Carole 🙂 Is there different grades of emu oil or are they all the same? What about the expiry date? Emu oil not that common over here (Asia), but understand more common in US 🙂 Have a good hols! Yes, there are different grades and qualities of emu oil. So for emu oil from the U.S. it should be AEA certified. I think Australia has a similar program, although I don’t recall the name of it. In reading about emu oil, I learned that oil that is not AEA certified may contain fillers, have been mishandled, or may contain impurities — all things that don’t belong anywhere near someone whose skin is already compromised by eczema. Inexpensive emu oils are out there, but I wouldn’t trust them for my niece’s daughter. I think this is one of those products where you get what you pay for. I asked about expiration, and was told that properly refined and packaged (in a dark bottle or opaque container to limit exposure to light) emu oil will be good for at least 1 year, probably 2. I would rather buy a small bottle and repurchase more often than get a big bottle, so I know I can use it up and then get a fresh bottle. Even the 1 oz. bottle I sent to my niece has lasted a few months already.